Here we go, enjoy the winter apple. An apple a day keep doctors away. Do you know every apple you enjoy is hand picked. 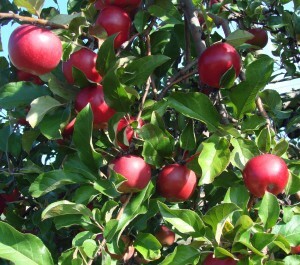 Apples are picked during fall. Some of the apple pickers do it as casual recreational work and supplement their income while strolling through the picturesque Orchards. Majority of apple pickers do it for their living driving hundred of miles to harvest in in central Washington, western Michigan, the shores of Lake Ontario in upstate New York, and Adams County, Pa. Commercial apple harvest is no leisurely work. It’s more very hard work . Teams of men, and a few women, go into the orchards with ladders in hand, then clamber up those ladders and lean into the trees. Their hands move fast, grabbing apples and dropping them into bags that is strapped to their waists. When the bag is full they run to the near by bin and fill them. The pickers are paid by the bins. These bins will hold up t0 1000 pounds. Depending upon the labor market and the harvest season, pickers are paid around 25 to 30 dollars per bin.